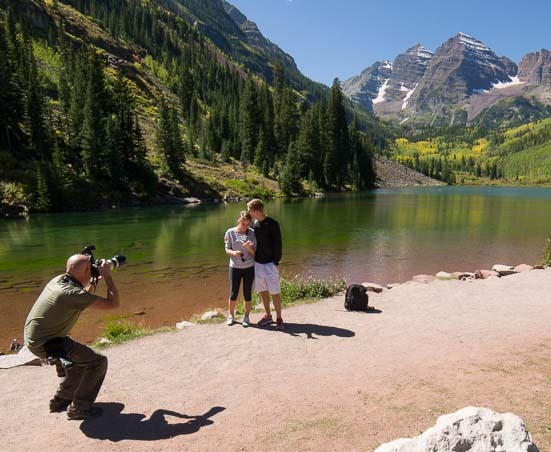 Romance at Maroon Bells Colorado!! A unique storm clouds fans out over the buggy at Steinaker Reservoir. The waitresses at Shooter’s Grill in Rifle, Colorado, are armed! We had chilled ourselves pretty thoroughly up in Wyoming, and we had some thawing out to do, so we stopped for just a moment to watch a beautiful storm cloud fanning out over Steinaker Reservoir and then hopped back in the truck and kept on going south. 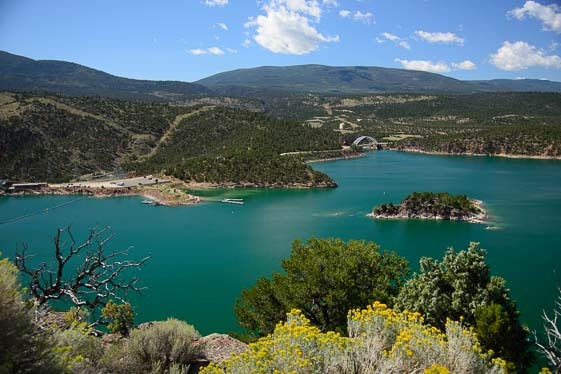 Our friends Mel and Elaine who are currently cruising the South Pacific in their sailboat (their blog is here), had just emailed us a joke about a place in Rifle, Colorado, where the waitresses apparently wear side-arms. It’s called Shooter’s Grill, and it was right on our route. So we absolutely had to stop in! We poked our heads in the door, and sure enough, we saw a waitress wearing a holster with a pistol! 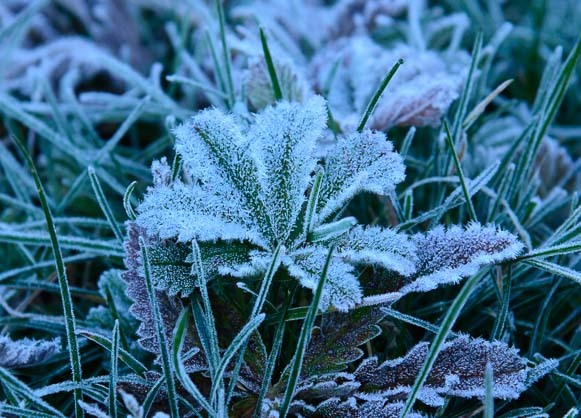 At Maroon Bells, we find frosty crystals on the ground around us. If internet jokes can be believed, it’s loaded (we didn’t quite get up the nerve to ask!). 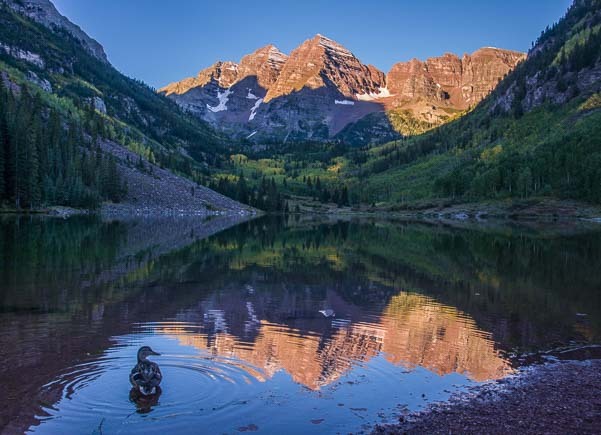 One of the most scenic areas in all of Colorado’s Rocky Mountains is Maroon Bells Scenic Area in the White River National Forest near Snowmass, and we were eager to catch a glimpse. This area is highly controlled by the US Forest Service because the most beautiful spot is tiny in comparison to the number of people that want to see it every day. During the summer, if you visit between 9:00 a.m. and 5:00 p.m., you have to park a few miles away and take a shuttle bus for $6 per person. However, before and after those hours you can drive all the way in with your own car, and holders of the America the Beautiful pass get in free. So, once again, we found ourselves setting our alarm clock for way too early in the morning and hustling off in freezing cold darkness so we could get some photos. When we arrived, we were blown away by the tranquility of the scene in front of us with placid water and mountains rising in the distance. We are not alone on the water’s edge! 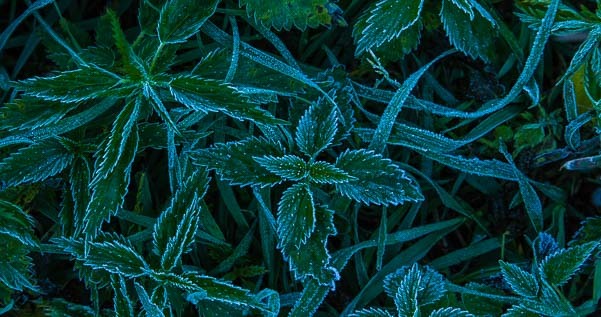 As I set up my tripod, I noticed the most beautiful and intricate frost patterns decorating all the leaves right at my feet. Never mind the mountain beauty, these delicate, jeweled patterns were covering the ground in white lace that stretched far up the hills behind us. In front of us a big crowd of photographers crouched and shivered and waited for the sunrise. 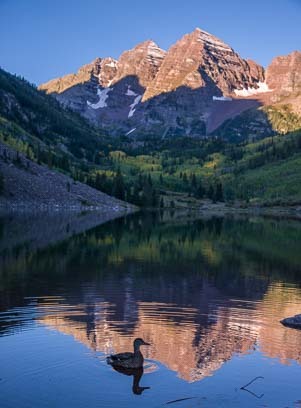 Maroon Bells is a place that every photographer wants to capture, kind of like birders checking off their birds! A duck pauses to check the view in the middle of his breakfast. However, getting a photo that is unique is really difficult. Getting there when the fall colors are most vibrant or during a particularly dynamic sunrise is the best way to get something that stands out. Unfortunately, we’d arrived a little late on an ordinary day. The aspen wouldn’t glow gold for another week, and the pre-sunrise pink had already faded. Just then a duck swam into my viewfinder. He paddled around and nibbled at the grasses in the water and paused now and then to admire the view with us. This little guy was used to photographers! What luck! He swam this way and that, criss-crossing the scene and creating circles of little wavelets around him. I snapped away in utter contentment. He didn’t seem to mind one bit, and he stuck around until he’d sampled all the tastiest grasses that were there. A few yards away, a beaver entertained another crowd of photographers with an equally delightful show. He darted in and out of a big mound of grasses, encouraging everyone to move a little closer each time he disappeared into the mound. The photographers knelt down and crept closer until they were lined up lens to lens, waiting for him to re-emerge! Once the sun was high in the sky, we could hear our own tummies rumbling, and we took off for a stroll around nearby Aspen where the endless coffee shops and bistros and farmers market were just coming alive. 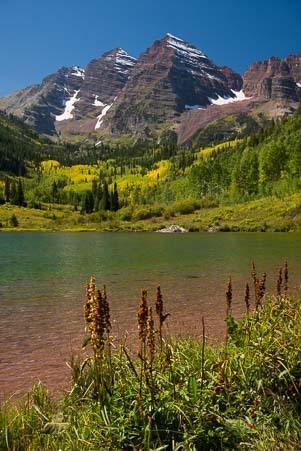 Maroon Bells looked different mid-day. As soon as we were bolstered with coffee and tea, and had had our fill of the farmer’s market, we decided to go back to Maroon Bells to see how it looked in broad daylight. This time we got in line for the shuttle bus and waited through two complete bus loadings before our turn finally came. As we stood in line, we noticed a guy in front of us who had some nice looking camera gear. 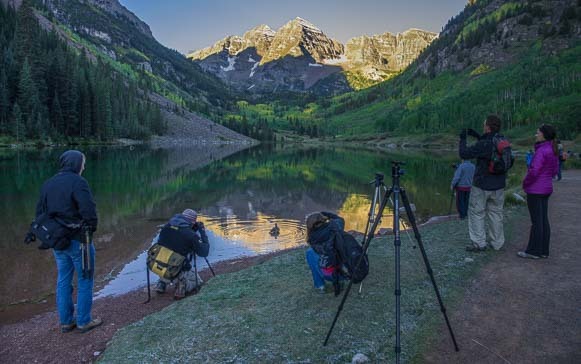 He seemed like a pro, and we wondered exactly how he would capture the spectacular landscapes of Maroon Bells. When we finally got out to the Bells, the scene had changed entirely. Algae growing in the lake was a vivid green against the bright orange-brown of the rocks, and there was none of the pink-orange glow of the morning. The algae was a brilliant green, and we heard later it isn’t always like this. While we got busy concentrating on bringing the magic of the landscape to life in our cameras, Mark found himself caught up in a truly magical moment. A guy standing right next to him suddenly dropped to his knees and began proposing in a very tender and sincere manner to a completely astonished and quite bewildered looking young girl. Wide-eyed and gulping back tears, she gaped at her boyfriend for a moment and then jumped up and down and began hugging him and staring at the new diamond on her finger all at once. Mark saw this young man drop to his knees to pop the question…! Everyone nearby turned to stare at them, their smiles as wide as could be, and then Mark noticed the pro photographer guy we’d seen on the bus leap into action and snap hundreds of photos of the whole scene. That photographer hadn’t missed a beat, and it was obvious he’d been hired to play it cool and then record this special moment for the young couple. Mark didn’t want to intrude on their most intimate moments, so he put down his camera and didn’t catch the drama until the couple had regained their composure and had begun posing for their photographer. I couldn’t believe I had missed the whole thing. I love that kind of stuff! And where was I? A ways further down watching a mom teaching her young daughter how to cast a fishing line. Geez! Not nearly as romantic as the couple getting engaged!! 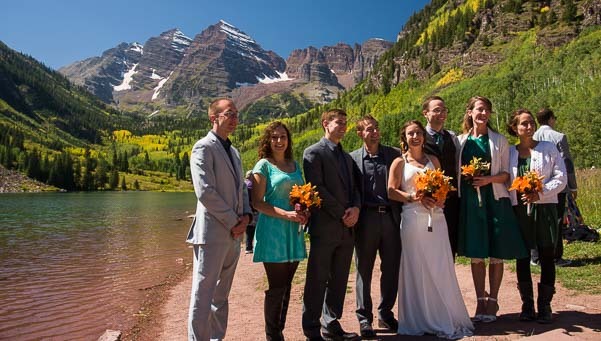 Maroon Bells is a popular place for romance, though, and it wasn’t long before I found myself swept up in another couple’s special declaration of love. A bride and her wedding party suddenly showed up next to me for a photo shoot! I’m not nearly as considerate as Mark, so I quickly began snapping away too, along with some other interlopers, and the bride graciously flashed a smile in my direction. Who can help but fall in love out here? In a gorgeous spot like this, you’ve gotta get a selfie with that backdrop! 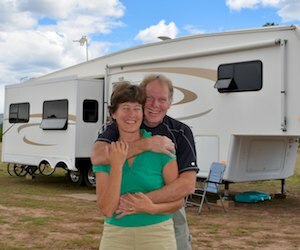 When we emailed this photo to our friends Rich and Mary back home, they quickly shot us a reply that they had spent their honeymoon camping here decades ago and that they had returned to celebrate their twenty-fifth wedding anniversary just a few years ago. 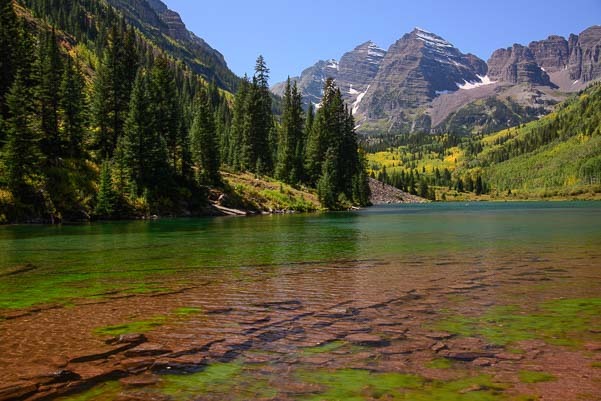 So, if you are in the mood for romance, or if you have a burning yes-or-no question you need to ask your girlfriend, consider Maroon Bells. It has worked wonders for a lot of folks! 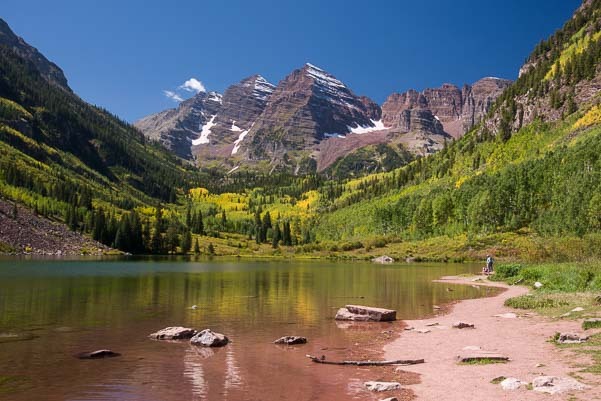 Bus service and fee system for getting to Maroon Bells with more similar info here. 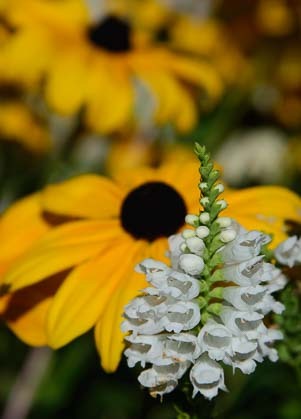 This entry was posted in Colorado and tagged Colorado, New, Travel, USA, WP Travel by Roads Less Traveled. Bookmark the permalink.